Last week I baked a low carb cake. Yes... I said a low carb CAKE. 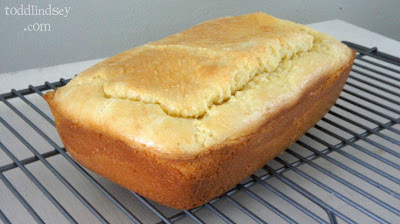 And it tasted just like regular pound cake... except that the texture was a tad bit grainy, due to the almond flour. Todd even told me that it tasted just like he remembered cake tasting like... Score! 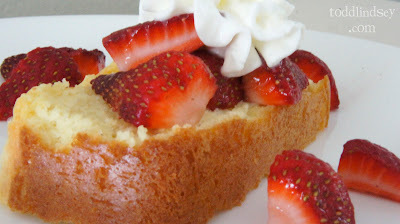 This recipe has 9 carbs per 8 servings but Todd and I probably got more like 10-12 slices out of our pound cake. NOTE: The recipe below says 1/2 c water when it should say 1/2 c unsalted butter, softened! Preheat the oven to 325* and grease a loaf pan. Beat the butter, cream cheese and splenda with an electric mixer until smooth. Pour into the loaf pan and bake for 45-50 minutes or until the top is golden brown. Let cool in the loaf pan for 10 minutes and then carefully turn out onto a wire rack to cool completely. Do you add the water before or after blending the butter and cream cheese? or, is the 1/2 c. water referred to in the ingredient list supposed to be 1/2 c butter. Thanks. Please clarify: Is it 1/2 cup butter instead of water or a 1/2 cup of each?? Is it 1/2 cup water or butter????? I used both butter and water. Used baking blend instead of almond flour, came out excellent. Yes, looks dry, add another egg or some olive or avocado oils.